"Our certainty that model Wankels will soon be here stems not only form the Graupner efforts, but from the strong rumors that others model engine makers are engaged in development (Webra is supposed to be well along with a design, for for example). There very probably is a Wankel in your future...!" That is the closing line from this article in the June 1968 edition of AAM, reporting on the new-fangled Wankel rotatory engines and their supposed superiority and therefore inevitability. Unfortunately, the problems plaguing Wankel production models - both model and full-size engines - never were overcome to the point that they would become a ubiquitous product. Low parts count, low friction, low vibration, and quiet operation could have been a game changer, but alas, it was not to be. See the OS-Graupner Wankel engine advertisement that began appearing in a World Engines advertisement in the March 1972 issue of American Aircraft Modeler. It may look like no engine you have seen before and it apparently runs by black magic. Smaller, lighter, more potent, it's a comer. SOME months ago we noticed a line on the cover of a popular mechanical mag; which touted an article on the latest "R/C engines." 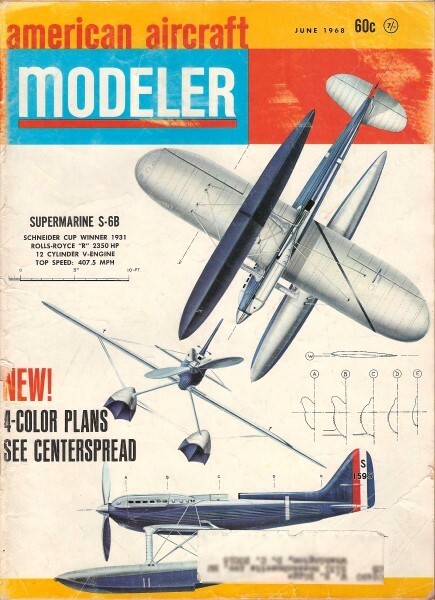 Thinking the products of some of our model plane powerplant makers had hit the big time, we grabbed a copy. The story was interesting, but it had nothing to do with our size engines. 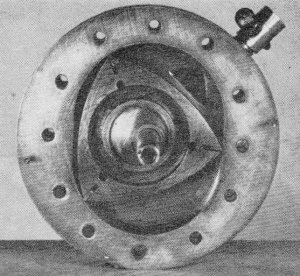 It described the latest version of a rotary combustion engine, a design known as the Wankel, after the German inventor. These engines were first heard of around 1959; have been under intensive development in many countries ever since. Actually, they are not unknown in our field. An Orion, powered by a homemade Wankel built by Floyd Neal, was demon­strated at the 1962 Chicago Nats - more on Neal's interesting designs later. One of the first Wankels to run in this country was built by William Thomas and Bill Jr. in March, 1960. Shown are the ro­tor. shaft with eccentric, and trochoid cavity. This was a side-port design. Later Thomas design was this five-lober which gave two firing impulses per shaft rotation. Diameter was 3-3/4". Turned 14-6 prop at 5,000 rpm. Merely experimental, no effort to save weight. Long intake manifolds on this Thomas Wankel were found to increase efficiency. All the Thomas engines were bench run, but were not flown. Spark ignition was used. Note balance weight at the rear. There have been many attempts at designing a successful rotary combustion engine - and there will doubtless be many more. But the design of Felix Wankel, a German scientist, looks like the most practical yet. So much so, that the idea was taken over by the German NSU concern (makers of motorcycles, autos) way back in 1951. 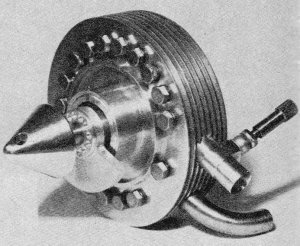 First use of the idea was for a small compressor in 1956; it was fitted to a conventional motorcycle engine which set a speed record at the Utah salt flats. Curtiss Wright Corp. secured rights to manufacture Wankel engines in the U. S., but has concentrated mostly in development of larger sizes -100 hp and over. C- W has, however, built and tested engines in all sizes from one of a couple horsepower fitted to a power lawnmower, up to several hundred, both liquid and air-cooled. They have driven extensively a standard U. S.-made auto, fitted with one of their engines. No such car is known to be anywhere near sale in the U. S. at present; but you can buy one from Germany (NSU has them now and Mercedes is working hard on one), and from Japan (the Toyo Kogyo concern). Some 20 concerns allover the world are licensed to build Wankels. And you can be certain the U. S. auto makers are hard at work on the same thing! Why all the interest and excitement? The Wankel has many advantages over conventional engines, for a wide variety of purposes. First, it is much smaller, simpler and lighter than even two-cycle engines. The basic Wankel (not including accessories) has only two moving parts. Furthermore, these parts do not operate on a start-stop-reverse sequence as do the piston and other components in conventional engines; those two parts are always rotating in the same direction. This conserves power, reduces friction and above all, makes it possible to balance the Wankel almost perfectly. Because of only two parts, there's lots less to go wrong. Machining is a bit tricky - mainly because it's entirely different from that of conventional engines, but special tooling is rapidly being developed. Present-day Wankels of automotive size can produce the same power in about half the weight and size of a standard engine. They are at least as economical in fuel. And they run smooth as silk! These same advantages will be seen soon in outboard engines (several U. S. outboard makers are well along in this field) . Lawnmower and other small units may be next. Like everything else, there are some disadvantages - though constant development is overcoming even these. One is sealing the rotor inside its chamber. Another is wear. Recent reports claim that these problems have been practically licked, however. It takes some study to understand how the Wankel operates, even though it has so few parts. Take a look at Fig. 1. The "cylinder" or chamber in which the triangular rotor operates is almost an oval, but not quite; there is a slight waisting ­ in at two points to form a very fat figure 8, a shape called a "trochoid." The three-pointed rotor has surfaces that are a bit rounded from tip to tip; also, as indicated in dotted lines in Fig. 1, there is a slight depression on each face. Now comes the tricky part! The shaft (you can't call it a "crankshaft" as there's no crank - better term it an "eccentric shaft") rotates in the center of the trochoidal cavity, and has an' eccentric attached. The center of the rotor fits over this eccentric. Key to the whole operation is two gears. The smaller is fastened rigidly and does not turn; Fig. 1 shows only the center portion of the engine body, but there are, of course, two end plates. The fixed gear is attached permanently to one of these. The small ring centered around the shaft in our five sketches represents this fixed gear, which has teeth on its outer periphery. Engaging these are teeth cut on the inside of the rotor. Thus, as the shaft is rotated (it's probably easier initially to envision the action by having the shaft turn the rotor, rather than the opposite, as occurs when the engine is running), the eccentric "wobbles" the rotor around the shaft. 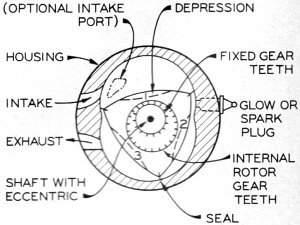 At the same time however, the gear teeth assure that the rotor turns around the eccentric, to keep the rotor points from jamming into the chamber walls. To keep everything moving correctly, there must be two-thirds as many teeth on the stationary gear as there are teeth inside the rotor. And this results in the rotor making a third of a revolution for each full revolution of the main shaft. Let's follow through as one face of the rotor goes through the sequence of intake compression-firing-exhaust. At Fig. 1, face 1 on the rotor is well along on the intake and is just about to start compressing the fuel mixture it has drawn in through the intake port. At 2A, compression has started. The eccentric and gear teeth are moving the triangle so that face 1 is approaching the wall of the enclosure, thus compressing the fuel. At 2B the spark plug fires (or it could be a glow plug which ignites the fuel at this point). In 2C, the rotor face is moving away from the wall, forced to do so by the expanding gases, and at the same time the rotor is pushing upon the eccentric to turn the shaft. At 2D the advancing tip of rotor face 1 has cleared the exhaust port, and the gases rush out. Wankel, installed in Orion was built by Floyd Neal, and flown during 1962 Nationals. Interesting point is pivoted flap over the exhaust port. Neal flew earlier Wankel ill 1961 Smog Hog. As with Thomas engines, rotor is lapped to snug fit between two side plates. Falecki SW-92. Weight of this neat design is 35 ozs. Outside diameter is 31j2'. Dis­placement is 9.2 cc. Produces 1 hp at 12,000 rpm. Note periphery intake. Maximum power developed so far, 1-1/2. An early Polish Wankel was produced by J. Falecki. Run on both glow and spark ignition, it produces 1-1/2 hp, has turned 21,000 rpm. Diameter is 3-3/8", weight 75 ozs. The displacement is 9.2 cc. Water-cooled Wankel, S. Gorski, Poland. Believed first marine Wankel in Europe. Twelve cc displacement, 29 oz. bare weight­less flywheel, pull-starter. Turned 23,000, 1-1/2 hp at 12,000. Most famous of the Wankels is the well-publicized Graupner which was seen at last year's Radio Control World Championships at Corsica. The continuous, smooth rotational process reduces vibration. Rotor face 1 is not doing all the work. of course. As it goes through the above cycle, faces 2 and 3 are just a jump or two ahead, and the shaft is thus being turned almost continuously. This is one reason for the "silky smoothness" that most test drivers have commented upon, who have driven Wankel-propelled autos. This, and the almost perfect balance of the engine. We have not shown any balance weights in Fig. 1, as they would just confuse matters. But picture an off-center weight on one or both ends of the main shaft, and attach just opposite to the fat part of the eccentric. The weight would be just enough to perfectly balance the off-center weight of the eccentric itself, and the rotor it is driven by. As can be seen, Wankel operation is a continuous smooth rotational process - not a harsh start-stop-reverse procedure, as in conventional engines. Though it has no moving valves as such, and draws in fuel mixture and shoots out exhaust fumes through ports (as in a two-cycle engine), the Wankel is a true four-stroke-cycle design. The style we show here is therefore equivalent to a two-cylinder, four-stroke of the usual design, or to a single-cylinder two-stroke - in number of "explosions" per revolution of the shaft - but the other advantages make it vastly superior to either. We have shown an engine with both intake and exhaust ports on the cavity periphery. 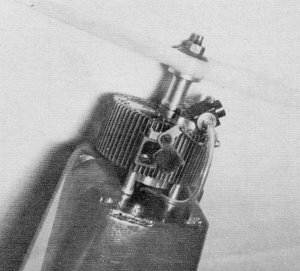 Some designers (Curtiss­Wright among them) prefer to put the intake port on the side of the housing; this has been found to increase low-speed torque and fuel economy at partial throttle opening - matters of little consequence to model engine users. Probably one of the first Wankel engines to run in the U. S. (other than those of Curtiss-Wright) was one built in a home shop by the team of William Thomas and Bill Thomas Jr. (Daytona Beach, Fla.); it was fired up in March, 1960. 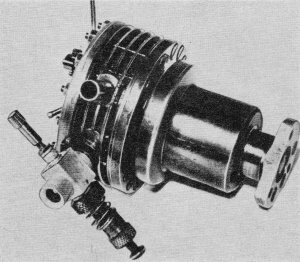 A photo of it with one side plate removed shows rotor, shaft with eccentric, and the trochoid cavity. The two gears are on the opposite side of the rotor. Note that this engine has a side port. Lightly spring-loaded metal strips at the rotor tips are for sealing. Bill Jr. says machining and sealing left much to be desired, but the engine did run. No effort was made to reduce weight (overall dia. was 4-1/2", weight was 9 lb.) or attain high power. An external view of this engine was carried on page 5 (July­Aug. 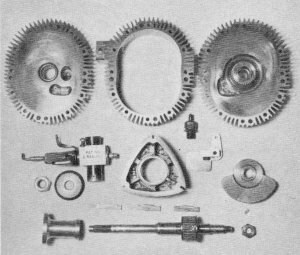 1963 issue of A. M.) and showed later Thomas developments in five-lobe rotors (the only ones of this type we've heard of). The five-lober gives two firing pulses per shaft rotation, is thus equivalent to a four-cylinder, four-cycle conventional type. 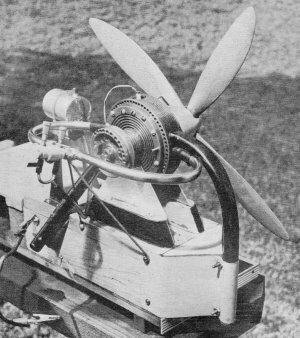 Another photo shows the most re­cent- Thomas five-lober; it is 3-3/4" OD, turns the four-blade 14-6 prop at 500 rpm, weighs 3-1/2 lb. Again, no effort was made at weight reduction. The Thomas' are interested mainly in engine develop­ment, and their creations have only been bench-run. They have used spark ignition on all their engines to date. The long intake manifolds seen in one photo were found to increase efficiency. Note the balance weight on near side of this engine. As mentioned earlier, Floyd Neal (St. Louis) flew a Wankel-Orion combo at the '62 Chicago Nats. Photo shows underside of the engine (Floyd also favors the side intake port) and interesting point here is the pivoted flap over the exhaust port, coupled to the intake throttle. As with the Thomas engines (and apparently with most small-sized Wankels) the rotor is lapped to a snug fit between the two side plates (larger engines employ spring-loaded strips on the sides as well as at the triangle tips). The fixed gear may be seen attached to the right-hand side plate. Below this is the counterweight that balances the off-center eccentric and rotor. Though the shaft at bottom is so-placed that you can't see there is an eccentric, there really is - it's the fat area toward the right end. Floyd ran his first Wankel in Nov., 1960. It was later installed in a Smog Hog, and flown on Feb. 23, 1961 - prob­ably the first Wankel-powered model flown in the U. S. Actually, Floyd is the only modeler we've been able to trace who has flown a model Wankel in the States - but there must have been others. The engine we show here was very much the same, but simply refined. That Nats flight was its first time in the air! The plane and engine were flown continuously for two years thereafter. This particular engine has .50 cu. in. displacement, turns a 12-6 prop at 12,000 rpm. Body size is 2-3/4 x 3", length is 4" and weight is 20 oz. This engine (as was the first one) is entirely of steel and cast iron, but Floyd started a copy with considerable aluminum to lower weight; however, at last reports it hadn't been completed. This builder has been so impressed with the Wankel design advantages that he purchased an NSU Spyder, which has a 64 hp R/C powerplant. We spotted several model Wankels in the very comprehensive manual entitled "Miniature Combustion Engines," a 436-page Volume published in Poland (inter­ested readers could obtain a copy from author Wieslaw Schier, Sulejowek k/ Warszawy, ul. Okiewska 1, Poland - and even if you can't understand Polish this very profusely illustrated book is extremely interesting). Mr. Schier kindly sent us pix of several Polish model Wankels; one of the first in that country was the SWT-1 produced by J. Falecki. It has been run on both glow and spark ignition, has 9.2 cc displacement and has produced as much as 1-1/2 hp. Diameter is about 3-3/8" and weight is about 75 oz. It has run at over 21,000 rpm with little loss of power, will idle at 4500 rpm on glow. Partial plans for this engine (enough for an experienced builder to follow) are in the Shier book. An SG-X water-cooled engine built by S. Gorski was used in a model boat in 1963. This is felt to have been the first Wankel-powered model boat in Europe .. This is a 12 cc displacement engine, weighs about 29 oz. bare (less flywheel, pull starter and other auxiliaries). It produces 1-1/2 hp at 12,000 rpm, has run as high as 23,000 with no problems. Another Falecki engine, the SW -92, is a neat design completely detailed in the Schier book. It weighs about 35 oz., has an outside diameter of 3-1/2" and 9.2 cc displacement. This glow engine will pro­duce 1 hp at 12,000 rpm, and a maximum of 1-1/2 hp. All the operational figures we have quoted were given by the engine designers. Note that the SWT-1 and the SW -92 have periphery intakes. 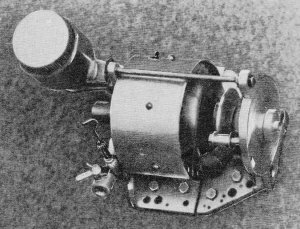 In the photo of the Gorski you can see one counterweight, which is apparently ma­chined from the same piece that the prop is tightened against. There is a similar counterweight at the rear of this engine. 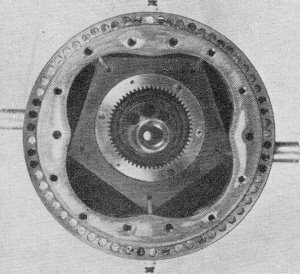 The counterweight of the SWT-1 is part of the two-diameter circular section to the right of the main engine body; this entire section rotates with the eccentric shaft. All the model engines we have depicted so far are the work of ingenious experi­menters, and doubtless all one-of-a-kind. So where can you buy a Wankel for your new R/C plane? Well, you can't as this is written - but you might by the time it's printed! 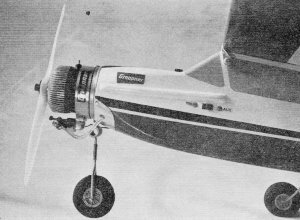 For the German Graupner concern demonstrated their engine at the 1967 R/C World Championships, and con­siderable data on it was given in the "New in R/C" section, Nov. '67. It was shown at Toledo this year. Briefly, it's a .25 cu. in. job, measures about 3" dia. x 3" long, weighs 13 oz. (production engines will be around 9-10 oz.) and is a glow engine. It turns a 10-4 nylon prop at 12,000 rpm, but later versions do quite a bit better. It is extremely smooth in operation, a fact we personally verified at the Graupner plant - by the simple but certain "hand-on-the-fuselage" test.! The dark line around the center of the engine is the cast iron "cylinder" inside which the triangular rotor moves. This is the "working" portion of the engine; the lighter colored sections fore and aft house the counterweights, bearings, etc., and of course, help in cooling and mounting. No exhaust damper is utilized on this engine, but idling speed seemed reasonably low. This engine started just a hobby project by an engineer of the Wankel-NSU group; it is thus backed by the vast know-how these pioneers have accumulated in this form of R/C engine. Our certainty that model Wankels will soon be here stems not only form the Graupner efforts, but from the strong rumors that others model engine makers are engaged in development (Webra is supposed to be well along with a design, for for example). There very probably is a Wankel in your future...!